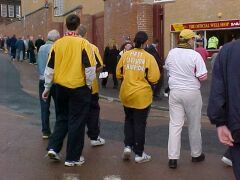 Season 2001/2002 will never be forgotten by Motherwell fans. It started last July at East End Park but that seems an eternity ago. We have since gone through several managers, good runs, poor runs and even dropped into interim administration. Still, there's nothing worse than a boring and forgetful season, is there? Billy Davies spent the summer rebuilding the team and a large and optimistic 'Well support travelled to East End Park for the opening game. We started with a lightweight looking midfield of Elliott, Dow, Martinez and Twaddle but we dominated the first half and were unlucky to go into the break level at 1-1. Around four o'clock on the opening day, our season started to go hideously wrong. Dunfermline rattled in four second half goals and we returned to Lanarkshire with our tails between our legs. Two home games gave us the chance to impose ourselves on the league but Dundee United managed to hold us to a 0-0 draw. We then needed a last minute equaliser to steal a draw against Kilmarnock and it was already abundantly clear that we had a long season ahead of us. Our appalling away record was beginning to take shape as we squandered a 2-1 lead at Pittodrie to lose 4-2. Our home record wasn't looking any better - Ned Kelly could only watch in agony as his header hit the inside of the post and allowed Livingston to escape Fir Park with a 0-0 draw. Billy Davies was beginning to look like a tired manager and his players were looking second rate. The confidence of the fans was at an all time low with many predicting certain relegation. What better time for a visit to Ibrox? Mark Brown turned in an excellent performance and saved a penalty but he didn't get much help from his team mates and we lost 3-0. The directors were sharing the same concerns as the fans and in the week after the Rangers game saw our first manager leave. Billy Davies was 'mutually consented' and left his office with a large cheque in his back pocket. 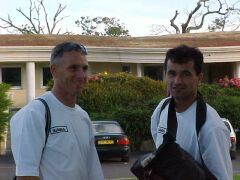 BD's coaches, Miodrag Krivocapic and John Philliben were brought in as caretaker managers. The first game after Davies' reign was at home to Hearts. The Jambos were going through a bad spell at this time but our side looked incapable of beating anyone. The new managers changed all that though and the team came out showing plenty of heart and a desire to battle that had been notably absent under BD. A peach from Kelly and a header from Elliott gave us a 2-0 win and lifted us off the bottom of the league. We were given the chance to forget about our league woes with a trip to New Broomfield in the League Cup. Airdrie had an excellent record that made a mockery of their status as a 'crisis club'. This fixture looked fairly tricky but our good performance against Hearts gave the large Motherwell following some hope. Sadly, an absolutely dire game was served up by Lanarkshire's 'finest'. Airdrie took the lead with a dodgy penalty, we scrambled home an equaliser and the hosts won it when Keith Lasley scored an own goal. The loss was disappointing but Motherwell fans were already muttering that the following Saturday's relegation six-pointer at McDiarmid was a much bigger game. And it was only the end of September! Part two of the season review is here.